I decided to take down my upcoming issues page since I was awful at updating it. Besides, ManWithoutFear.com already maintains a way better “coming soon” section than I do, so I’ll just replace that page with something else people might find useful. Having said that, there are plenty of things coming in June that deserve mention. This week, on June 5, we’ll see the final issue of Daredevil: End of Days hit the stands, along with the very first issue of Daredevil: Dark Nights, the anthology series that starts off with a three-parter written and drawn by Lee Weeks. I haven’t been crazy about End of Days (preview here), but I’ll be sure to do a write-up of some kind once all the pieces are in place. Daredevil: Dark Nights (though I’ve also seen it misspelled Dark Knights and Darkest Knights, which is weird) will definitely be an intriguing read. I like not really knowing what to expect, and am curious to see the marriage of classic Lee Weeks artwork with his own script, and to see what kind of tone he’ll be going for. The preview for Daredevil: Dark Nights #1 is available here, though I really hope they actually fixed that seriously botched blurb on the intro page before it went to press. It will also be interesting to see who else will contribute to this series once Weeks’ turn at the helm is over. I guess we’re going to have to wait until the September solicitations coming out next week to find out! As you may or may not have heard, Daredevil #27 has been pushed back a week and is now coming out June 26. 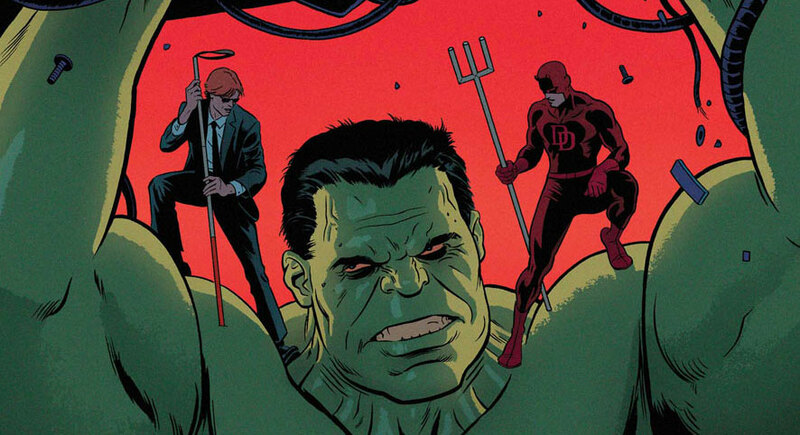 While this is a bummer (because, damn, that was some cliffhanger they left us with), there is some consolation to be found in the fact that Daredevil will be guest-starring in the Indestructible Hulk two-parter which kicks off with issue #9, due out June 19. As a nice bonus, it also sports an awesome cover by none other than Paolo Rivera! What are you guys most looking forward to in the coming weeks? I think that Nelson & Murdock’s mystery benefactor is Banner too. Makes sense. Especially if you’ve read Indestructible Hulk #1 and recall the scene where Banner reveals his leverage over S.H.I.E.L.D to Maria Hill. I’m looking forward to these Hulk issues. 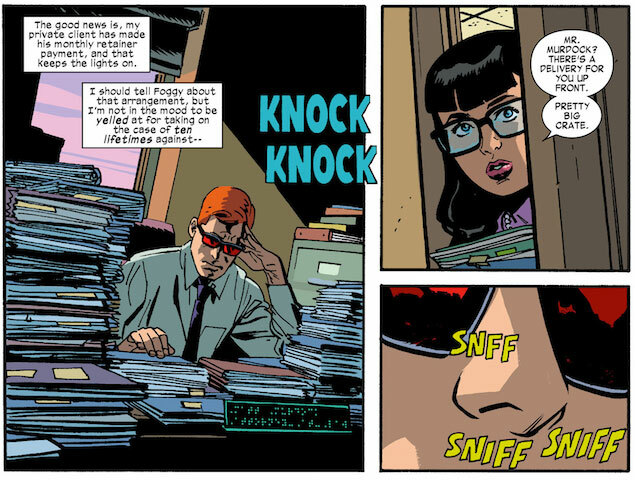 But the only thing i’m worried about is that they won’t be collected in the Daredevil by Mark Waid trades / hardcovers. So, I must say one thing especially – good form, ma’am, good form. To acknowledge ManWithoutFear.com in such an open and genuine complimentary way really shows character. In short, well-done, and keep up the good work. Oh … and one totally random, non-sequitur thought: I *really* wish that they hadn’t used the word “fap” so prolifically for the scenes with the “over-audio” being the sound of birds flying. I wish I didn’t know that stupid slang word. Ugh. I’m glad you mentioned The Trial of the Incredible Hulk. That’s always been my favorite Hulk show/movie, despite the terrible special effects and the fact that Daredevil’s costume is nothing like the comic books. I still have a VHS tape of when it originally aired (yes, I’m that old). I was a fan of Rex Smith from the series Street Hawk, so was very happy to see him as Matt. My favorite parts are when he interacted with his coworkers and opened up with David on the finer points of how he got his powers. (“You doctors don’t know a lot about radiation.” “I happen to know a LOT about it.”) Neat to see David Banner get to open up to someone on his level too.